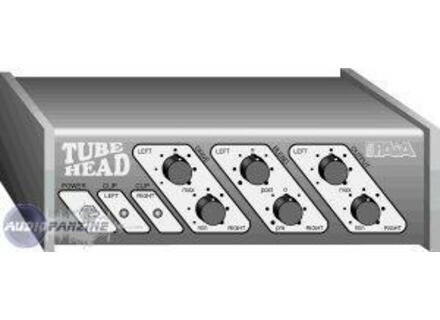 TUBE HEAD, Tube Pre-amp from Paia. It is a double prampli lamps make kit. There are two 12AX7 tubes, the channels are independent making it possible to have 2 preamps in a single or stereo (but you must have the same rgler each channel). The actual models in 1U 19pouces or "standalone", a kind of box to show. Jack on the rack and RCA I think for the other. Trs device is simple to use. Prgain a "drive" which also helps to saturate the lamps, which allows a mix shuffled the distorted signal with the clean signal, and a single output volume. The cool thing is that you can have either a clean operation to give a little heat is an effect of distortion quite marked. The only difficulty is that it must be same make as the socity ACAP only sells kits. The construction is Reserved those who are used, what a perfect electronic nophyte in with just an iron and a clip will succeed. But it must be good with those little hands. It has been one of my first electronic kit also. This store is not pramp in high-end audiophile equipment. Dj design uses the famous trick of undernourishment lamps to push the blame, and thus produce a lot of harmonics, a discreet effect a real mush. Be careful also with a gain background, the signal is mega-compress (another good use) and the breath goes forcmment, hlas means even a little bit of AC 50hz, so it BMOL for a device that might be greatly bnefici better filtering of power supply (AC power must be arranged). I really enjoy the sound of the lights, I like to listen to CDs while passing it. It serves me as a warm up before recording the signal with my sound card. on the other hand recently I thought that perhaps, as the lamps had a kind of aura in the mediums that give an illusion of claret as it could sometimes give the impression of a lack of transparency, obviously the more you saturate more you lose detail. It cost in 1000F may be more due to customs, good these days seen a ton of amp simulation one might think that the Tube Head is less important, but good in fact they have a a much less rich. Other hand we always need a preamp BEFORE numrisation another time, and this one did his job perfectly. I would recommend not possibly be taken not to make great sounds with microphones, but it is perfect when it comes to Global Warming while on a synth or guitar or drums. Roots sound!